in Memory of "Uncle Jack" Kelly! Last spring I embarked on a fundraising partnership with the Leukemia and Lymphoma Society’s Team in Training program to raise money in memory of my best friend’s father, Jack Kelly, who died from Acute Myeloid Leukemia (AML) thirty years ago. Initially I registered to run the Nike Women’s Marathon in San Francisco that took place this past October but had to switch races when I suffered a stress fracture to my hip in July. After a couple months of rest, rehabilitation and a healthy dose of frustration I have renewed my effort and am registered to run the Phoenix Rock and Roll Marathon on January 16th 2011! As a member of Team in Training I have a coach, a training program, and teammates to support me in my training efforts. I also have a very supportive husband who picks up the slack so that I go out for long runs. I have pledged to raise $3500 by race day and run 26.2 miles on January 16th! I am asking you to help me by making a donation to my fundraising campaign. As just about everyone knows- I am not an athlete; the closest I’ve ever come to endurance sport participation has been carrying twins. Up until a year and a half ago I couldn’t run more than a mile. By race day I will have run more than 850 miles in preparation for this event! Every day, we’re presented with opportunities to get involved and make a difference. We can choose to make an effort to make the world a better place, or take the easier way and sit back and observe. I chose to run a marathon with the Leukemia and Lymphoma Society because I loved my Uncle Jack dearly and this is my way of honoring his memory and the thirtieth anniversary of his death. You can donate two ways: By mail or securely on the Leukemia & Lymphoma website link below! Either way I am grateful for any support you can give me. You can rest assured that I will be naming a blister in honor of every person who makes a donation to my race! Help cure blood cancer AND have a blister named after you? What more could you ask for? So, on behalf of The Leukemia & Lymphoma Society, thank you very much for your support. I greatly appreciate your generosity and confidence! This morning it was necessary to take Larry, Moe and Curly to REI to purchase winter coats. This year I decided that I don’t want to be one of *those* mothers who fail to purchase adequate winter coats for their children. (I was just such a mother last year and assumed fleece was sufficient) REI is a world of excitement for the stroller bound – the racks are close together thereby making it all too tempting to pull on every article of clothing that comes within reach. And for Curly, they are all good enough to eat. As I parked the double wide in between a rack of clothing in the children’s department, Larry took off running. He was relatively easy to locate (even while dashing under racks) on account of his chortling. As soon as I wrestled Larry into a puffer jacket a kindly REI Sales Associate offered to distract Larry with her infrared gun while Moe and Curly were briefly released from captivity to try on their respective coats. While I had conflicting feeling about Larry being flashed in the eyes with laser beams it provided me a moment to breathe – and coincidently the people who had fled the children’s department upon our arrival seemed to return now that Larry was adequately entertained. Had there have been two size 2T jackets in the store we would have quickly proceeded to the check-out line and made a fast escape – but alas we were directed to customer service where a line was already forming. While waiting in line Larry spotted a bald older gentleman with a belly – he automatically assumed it was my Mother’s new husband Ed – who Larry affectionately refers to as “Grandma”. (My Mother prefers to be called Grammy… like the award) The excitement of sighting “Grandma” proved too much for Larry as he quickly began to tug on the gentleman’s coat hem and yell, “Grandma, Grandma, and Grandma it’s me - your Larry!” As luck would have it, Larry happened upon the only senior citizen in Oregon who seemingly detests children. While I gently reminded Larry that his “Grandma” lives in Arizona he remained unconvinced and pleaded for “Grandma’s” attention. Upon completing his transaction, the elderly gentleman took his leave as Larry broke free from my restraint and clamored across the store hollering “Don’t leave Grandma; it’s me; your Larry! 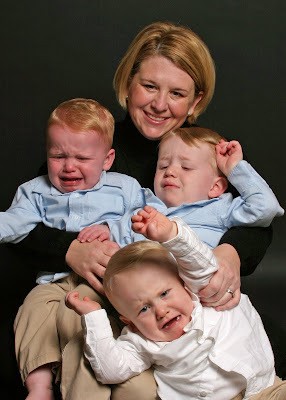 STOP PLEASE!” I abandoned the stroller containing my now crying twins and retrieved Larry. As I managed to collect my wits long enough to order a second jacket in size 2T I looked around and noticed that everyone was staring at me. With.That.Look. As I retold this experience to my BFF NBF she reminded me that once upon a time not so long ago I used to dispense “that look” without pity on every mother whose children interfered with my shopping experience. NBF was relieved to learn that whenever I have the opportunity to shop alone I routinely dispense “that look” just for old time’s sake.